Happy Friday everyone! This week’s link roundup brings you what will possibly be the scariest three minutes you’ll ever see. Seriously, do not watch this video if you scare easily, because it is massively creepy (so of course I loved it). It’s Banned Books Week. If you check out their list of most frequently challenged books of 2011, The Hunger Games is at number three, for reasons such as “anti-ethnic” and “occult/satanic.” Um, I don’t think someone read the same book the rest of us did, do you? I don’t understand why this never caught on. 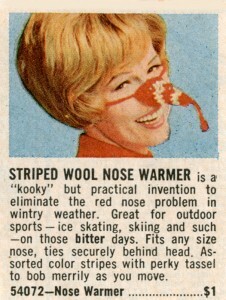 A Nose Warmer? So funny! I couldn’t watch the video–I’ll take your word for it that it’s crazy. I promised my BFF that I’ll finally read Hunger Games. Sometimes I wonder if people who try so hard to ban book actually read the entire book. How crazy is that nose warmer?! I’m sure the person who made it thought they’d hit on a genius idea, though. I think I recognize that bedfellow from an incident in the 70s after way too much Lambrusco and that’s all I’m saying. The nose warmer is hilarious. Heh.